Mandy was discovered by Cathy who runs Top Dog Boarding in Norman where I board my dogs when I'm out of town. While driving to and from work she noticed this little girl tied to a tree night and day, turns out her elderly owner had gotten to the stage where family had to come in and take care of her and for whatever reason they left Mandy in the yard to fend for herself. Cathy asked if she could take the dog and attempted to place her, but that home didn't work out. A mutual friend told us about Mandy and I told Cathy I'd pick her up and foster her until a home could be found. 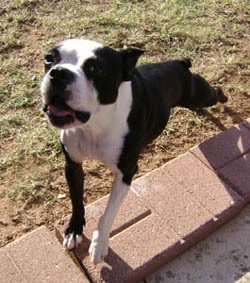 You could NOT find a sweeter Boston, impeccable house manners, did fine in a crate while I didn't even know if she had ever been in a crate, wanting nothing more than to give kisses and get belly rubs. I told my vet about her as he has Bostons and he thought he knew of another client that was looking for a Boston female. He checked Mandy out, did a heartworm check and found her to be in excrellent health. "Joyce" was thrilled to be giving a needy dog a home and Mandy went home with her last night. So glad she is a client at Midwest Vet as maybe I'll get to visit her from time to time. Good luck sweet girl, we miss you already! 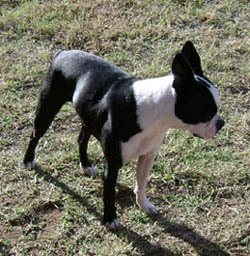 Copyright © 2010 ~ 2017 Oklahoma City Boston Terrier Club & JLS Canine Services Web Design.